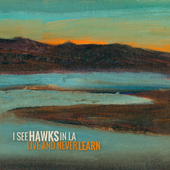 After tough times, I SEE HAWKS IN L.A. are back with their eighth studio album, Live And Never Learn! I See Hawks in L.A. soared relatively trouble free for the first decade of their existence, but in 2018 they’re emerging from a string of confrontations with mortality, life choices, and the slow leakage of youthful possibility. It’s been almost 17 years since the release of their eponymous debut – on September 11, 2001. They didn’t get rich, they didn’t get famous, and yet they’re still here, perhaps benefitting artistically from the rocky passage. The rich flavor of battered soul. It’s clear these Hawks are in it for the music, for each other, and for the adventure of it all. Loving families, good friends, and making music helped get the band through those times, personally and artistically. The Waller/Lacques songwriting is augmented here with contributions from Hawks bassist Paul Marshall and drummer Victoria Jacobs. One song, the rocking „King of the Rosemead Boogie,“ features twisted lyrical and spiritual contributions by members of Old Californio. Two songs, „White Cross“ and „Singing in the Wind,“ were co-written via email with Peter Davies of the U.K.’s Good Intentions, and feature the Hawks‘ signature electric sounds of reverby Telecaster, thumping Fender bass, and tight harmonies, while the lyrics take listeners from the backstreets of Memphis to the windswept moors of Northern Ireland. Many of the tracks on Live and Never Learn directly address the band’s personal struggles. „Poour Me“ explores the dead-serious theme of a drunk’s self-pity but it’s wrapped up in a light-hearted and humorous approach familiar to any Hawks fan. Dave Zirbel adds classic country pedal steel for this regretful farewell to drinking, as Waller calls out, „I guess I better not have no more.“ Zirbel hit the emotional core of many songs on this record, subtle and surprising as always. Drummer Victoria Jacobs, also an accomplished songwriter, contributes a wistful meditation on the passing of time with her psychedelic folk masterpiece „Spinning.“ Night worries and fantastical images illuminate this hauntingly beautiful tune. Jacobs also narrates another touching fable in „My Parka Saved Me,“ recounting her real life head-on collision as a teenager on a winter afternoon by Lake Michigan. The Hawks‘ doo-wop vocals, ’50s chords, and Danny McGough’s sweet B3 give the terrifying tale a soft landing. Some classic Hawks themes also appear on this album. 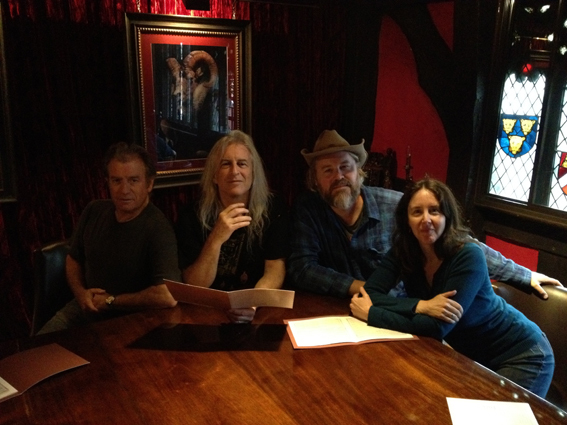 „Planet Earth“ and „Ballad for the Trees“ reflect the band’s longtime interest in ecology and conservation. „Stoned With Melissa“ appears to be another Hawks weed anthem, but with a sad and realistic twist. „King of the Rosemead Boogie“ introduces an imagined hero of the San Gabriel Valley in all her (his?) glory. Regret and earth/spirit duality return in „Isolation Mountains“ and „Tearing Me in Two,“ both brought to fruition by the deep fiddle of longtime collaborator Dave Markowitz, and broke-the-mold accordionist Richie Lawrence. This spring, good news has returned for the Hawks and their families. The band finished tracking and sent the files off to five-time Grammy-winning mixer Alfonso Rodenas (Los Tigres del Norte), who mixed Mystery Drug as well as several other Lacques-produced projects. The mixes came back sounding great, and the Hawks felt a surge of optimism, perhaps irrational, perhaps a crucial tonic to these gloomy times. Now Live and Never Learn is here and the Hawks sound better than ever. With shows in California and the U.K. coming up this summer they’re feeling good and can’t wait to hit the stage and sing, together again, together as always. Kommentare deaktiviert für After tough times, I SEE HAWKS IN L.A. are back with their eighth studio album, Live And Never Learn! Three more re-issues of THE BRANDOS on Blue Rose available now! Nach 5 Jahren und harten Zeiten sind sie zurück mit einem neuen Album – I SEE HAWKS IN L.A.!